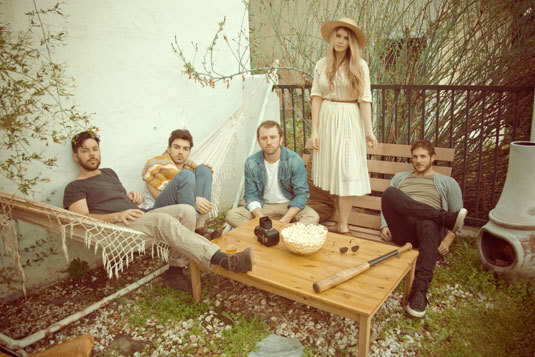 Local indie folk band Milo Greene is playing the El Rey on Saturday, November 17. Joining them is breakout Toronto-based musician Alfie Jurvanen, more known as Bahamas. He’s played piano and guitar for Feist in the past and his 2009 album earned him a Juno nomination in 2010. How’s this for a solid line-up?! Tickets to the show are $16, doors at 8:00 p.m. and this show is all ages. Thanks to our friends at Goldenvoice we have some tickets to give away. Enter the contest below for a chance to win! You must have a Twitter or Facebook to enter the contest. First make sure you’re following Grimy Goods on Twitter here and/or “like” our Facebook page here. We’ll pick winners on Wednesday, November 14 The winners will be direct messaged on Twitter or contacted below their contest entry comment on the Grimy Goods Facebook page. Winners will have until 10 a.m. Thursday, November 15 to claim their win or the tickets will be forfeited. To increase your chances, enter the contest both ways! Via Twitter: Tell us why we should hook you up with tickets! Send your Tweet to “Hey @GrimyGoods,” mention “@MiloGreene at @ElReyTheatre” and be sure to include the following hashtag in your Tweet: #ContestMILO. Via Facebook: Just leave a comment on the Grimy Goods Facebook page telling us why we should hook you up with tickets! Also, be sure to mention Milo Greene at the El Rey Theatre so we know which contest you’re entering! This entry was posted in Giveaways and tagged bahamas, concert tickets, folk, free tickets, giveaways, indie music, Milo Greene on November 12, 2012 by Sandra Burciaga Olinger.